How to charge and account for VAT on the movements of goods within the single market. This notice explains the way VAT is charged and accounted for on movements of goods within the EU single market and how businesses should account for VAT on goods they buy from other EU member states. You should read this notice if you’re involved in the movement of goods between EU member states or make supplies to diplomatic missions, consulates, international organisations or NATO visiting forces. Some or all of paragraphs 4.3, 4.4, 4.5, 5.2, 8.5, 17.10 have force of law. Those parts affected are noted. The single market is a term that has applied since 1 January 1993 to trading between member states. This covers intra-EU supplies of goods. With the introduction of the single market, goods coming into the UK from other member states are no longer called imports, but are referred to as acquisitions or arrivals. The term ‘import’ is only used for goods coming into the UK from countries outside the EU. For further information on imports, see Imports and VAT (Notice 702). With the introduction of the single market, goods leaving the UK to go to other member states are no longer called exports, but are referred to as dispatches or removals. The term ‘export’ is only used for goods leaving the UK to go to countries outside the EU. For information about exports, see VAT on goods exported from the UK (Notice 703). From 1 May 2004, the VAT territory of the EU is made up of 28 member states. The following table shows the member states and their territories which are included or excluded for VAT purposes. For further information about the territory of the EU for Intrastat purposes, see Notice 60: Intrastat general guide. From 1 January 2007 Bulgaria and Romania joined the EU. Liechtenstein, the Vatican City, Andorra and San Marino are not within the EU for VAT purposes. VAT on goods traded between member states is not collected at the frontier. The way VAT is accounted for on intra-EU supplies largely depends on whether the recipient of the supply is registered for VAT in the member state of arrival. For further information see sections 3 and 6. For these purposes movements of goods between member states within the same legal entity (often referred to as a transfers of own goods) are treated as supplies (see section 9). Special rules apply in the case of natural gas and electricity, along with heat and cooling (see VAT Information Sheet 21/10 Place of supply of natural gas and electricity (also heat and cooling)). For information about the VAT treatment of supplies involving excise goods, see paragraph 15.4. The system for collecting statistics on the trade in goods between member states is known as Intrastat. All businesses carrying out trade with other member states must declare the totals of their sales and acquisitions on their VAT Return. Traders whose EU trade exceeds a legally set threshold have to complete additional statistical information called Supplementary Declarations. Statistics are compiled from the Supplementary Declarations and information supplied on the VAT Return. For further information on this, see section 18 and Notice 60: Intrastat general guide. The rules are the same, but there may be some small variations. If you want to check the position in another member state you should contact the relevant VAT authority (see paragraph 2.11). Details of contact addresses and other useful information provided by the VAT authorities in other member states can be found on the European Commission website. The amount you can reclaim as input tax is subject to the ‘normal rules’. These include the evidence you must get and any additional partial exemption calculations you’re required to carry out. For further information about this see dealing with input tax in the VAT guide (Notice 700) and Notice 706: partial exemption. Goods sent to the Isle of Man from the UK are treated as domestic supplies for VAT purposes. Consequently the rules described in this notice do not apply and VAT must be charged at the appropriate UK rate in the normal way. On the other hand, goods sent to the Channel Islands are treated as exports from the EU for VAT purposes. For further information about exports, see VAT Notice 703: export of goods from the UK. You should use the tax point as the reference date for including the supplies on your VAT Return, EC Sales Lists and, normally, your Intrastat Supplementary Declarations. But if it’s more convenient, you may use the calendar month during which the goods arrive in, or are dispatched from the UK for your Intrastat Supplementary Declaration, see Notice 60: Intrastat general guide. The receipt of a payment in these circumstances does not create a tax point for your intra-EU supply. But you must issue a VAT invoice to your customer for the amount paid to you (see paragraph 16.9) and the date of issue of the VAT invoice will be the tax point. Where you issue a series of invoices relating to the same supply of goods, the time limit for getting valid evidence of removal begins from the date of the final invoice (see paragraph 4.4). (*see paragraph 16.10 in cases where the time limits for removal and getting evidence are not met) No Yes - as a dispatch. See paragraph 6.17 for distance sales and Notice 60: Intrastat general guide. As the supplier your liability to account for VAT depends on the circumstances. Article 28C(A) of the EC Sixth Directive (77/388/EEC) states that member states shall exempt certain supplies subject to conditions laid down for the purpose of ensuring the correct and straightforward application of such exemptions (zero rating) and preventing any evasion, avoidance or abuse. The UK uses the term ‘zero rating’ rather than ‘exemption’ used in EC law to avoid confusion with the use of exemption elsewhere in UK law. The UK VAT law relating to the zero rating of removals of goods for VAT purposes can be found in the Value Added Tax Act 1994 sections 30(8), 30(10) and regulation 134 of the Value Added Tax Regulations 1995. This paragraph has force of law. Paragraph 4.9 covers the checks that you must undertake to make sure that your customer’s EU VAT number is valid. Your records must be able to show that the goods you supplied have been processed or incorporated into the goods removed from the UK. In cases where the third person is not in the UK but in another EU member state, the same conditions will generally apply to allow you to zero rate your supply. If you cannot get and show a valid EU VAT registration number on your sales invoice you must charge and account for tax in the UK at the appropriate UK rate. You should carry out normal commercial checks such as bank and trade credit worthiness references before you start making supplies to an EU customer. As part of these checks you should ask your customer to supply you with their EU VAT number.You should get confirmation of their EU VAT registration number in writing. You should keep the letter or advice you’ve had from your customer for future reference because one of the conditions for zero rating your supply is that you hold a valid EU VAT number for your customer. For further information on normal commercial checks, see Joint and several liability for unpaid VAT (Notice 726). When you write to your customer, ask them to provide you with the number which has been allocated to them for intra-EU trade. In certain countries for example, Spain and Italy, businesses are required to register their VAT number for intra-EU use and if they do not do this, the number will show as invalid on the Europa website. If they do not supply you with their VAT number then you’re obliged to charge UK VAT on any supplies of goods. If you’re supplying services and your customer cannot supply you with a VAT number then you must make sure you have sufficient evidence to show that your supply is to a business in order to zero rate the supply. You should check the validity of the number you have been given by making sure it follows the format at paragraph 16.19. Further checks on the validity of a customer’s number should be made using the Europa website. All member states share these arrangements and businesses in other member states can verify a UK VAT registration number in the same way. When making an enquiry on the Europa website you must identify yourself by entering your own VAT registration number and print out a record of the date and time that the enquiry was made and the result of the enquiry. If it later turns out that the customer’s number was invalid, for example, the tax authorities database was not up to date, you’ll be able to rely on the validation record as one element to demonstrate your good faith as a compliant business and, in the UK, to justify why you should not be held jointly and severally liable for any VAT fraud and revenue losses which occur. You must also regularly check your EU customer’s VAT registration number to make sure that the details are still valid and that the number has not been recently deregistered. Alternatively you can contact the VAT: general enquiries helpline to validate your customer’s VAT registration number and to verify that the name and address is correct. You do not have to account for VAT, but only if you have genuinely done everything you can to check the validity of the VAT number, can demonstrate you have done so, have taken heed of any indications that something might be wrong and have no other reason to suspect the VAT number is invalid. HMRC does not expect you to go beyond what’s reasonable, but will be seeking to identify what actions you took to check the validity of your customer’s EU VAT registration number. This will focus on the due diligence checks you undertook and, most importantly, the actions taken by you in response to the results of those checks. We would consider ‘reasonable steps’ to be, you genuinely doing everything you can to check the integrity of the VAT registration number, being able to demonstrate you have done so and taking heed of any indications that the number may be invalid. VAT will be chargeable if we do not consider you’ve taken reasonable steps. You’ll have to account for VAT at the appropriate UK rate. For information about the conditions for zero rating the sale of a container to a VAT-registered customer in another member state, see VAT Notice 703/1: supply of freight containers for export or removal from the UK. Vague descriptions of goods, quantities or values are not acceptable. For instance, ‘various electrical goods’ must not be used when the correct description is ‘2,000 mobile phones (make ABC and model number XYZ2000)’. An accurate value, for example, £50,000 must be shown and not excluded or replaced by a lower or higher amount. Where you sell a motor vehicle, which is collected by your customer or their representative, it may be difficult to get satisfactory evidence of removal from the UK. In these circumstances, a copy of the vehicle registration document issued by the authorities in the Republic of Ireland will normally provide satisfactory evidence of removal if supported by other evidence described above and in paragraph 5.1. In addition to the examples of acceptable documents relating to the sale listed in paragraph 5.1, travel tickets can also be used to demonstrate that an intra-EU journey took place for the purpose of removing the goods from the UK. If your VAT-registered EU customer is arranging removal of the goods from the UK it can be difficult for you as the supplier to get adequate proof of removal as the carrier is contracted to your EU customer. For this type of transaction the standard of evidence required to substantiate VAT zero rating is high. Before zero rating the supply you must ascertain what evidence of removal of the goods from the UK will be provided. You should consider taking a deposit equivalent to the amount of VAT you would have to account for if you do not hold satisfactory evidence of the removal of the goods from the UK. The deposit can be refunded when you get evidence that proves the goods were removed within the appropriate time limits. You, as the supplier of the goods, or your customer can appoint a freight forwarder, shipping company, airline or other person to handle your intra-EU supplies and produce the necessary evidence of removal. But you remain legally responsible for ensuring that the conditions for zero rating supplies of goods to other EU member states, as set out in paragraphs 4.3, 4.4 and 4.5, are met. This includes getting and holding evidence of removal of the goods from the UK. If you use a freight forwarder, consignments (often coming from several consignors) may be aggregated into one load, known as groupage or consolidation cargo. The freight forwarder must keep copies of the original bill of lading, sea waybill or air waybill, and all consignments in the load must be shown on the container or vehicle manifest. You’ll be issued with a certificate of shipment by the freight forwarder, often supported by an authenticated photocopy of the original bill of lading, a sea waybill or a house air waybill. Where such consignments are being removed, the forwarder may be shown as the consignor in the shipping documents. Certificates of shipment are usually produced by packers and consolidators involved in road, rail and sea groupage consignments when they themselves receive only a single authenticated transport document from the carrier. It’s an important document, which should be sent to you as soon as the goods have been removed from the UK. The certificate of shipment must be an original and authenticated by an official of the issuing company unless it’s computer produced, on a once-only basis, as a by-product of the issuing company’s accounting system. A properly completed certificate of shipment will help you to meet the evidential requirements described in paragraph 5.1. Goods sent by post may be zero-rated if they’re sent directly to your customer registered for VAT in another EU member state, and you hold the necessary evidence of posting. The receipted forms described, plus the Parcelforce Worldwide statement of account or parcel manifest listing each parcel or multi-parcel, will provide evidence of removal. An individual barcode label must be affixed to every parcel. You do not need to complete the customs export declaration for goods being sent to another EU member state. If you arrange for the parcel to be collected from your premises the collecting driver will sign your printed receipt. This is your proof of shipment for EU destinations. If the parcel is taken to a Post Office, the counter clerk will provide you with a printed proof of shipment from the Post Office SmartPost system. This will show the overseas delivery address, date of dispatch and unique consignment number. You should keep this printed proof of shipment as your evidence of removal. All of the individual parcel declarations, plus either the manifest or the statement of account listing each dispatch will provide proof of removal for VAT purposes. Courier and fast parcel operators specialise in the shipment of goods to overseas destinations within guaranteed timescales. Most courier and fast parcel operators do not issue separate certificates of shipment. The invoice for moving goods from the UK, which bears details of the unique airway bill numbers for each shipment, represents normal commercial evidence of removal. In addition, many express companies are able to offer a track and trace service on their websites where the movement of goods can be traced through to the final destination. This information can be printed and also be used to confirm removal from the UK. A few companies still use a documentary system based upon a dispatch pack containing accounting data, a customs export declaration and receipt copies of the relevant house airway bill or consignment note. These packs are issued to customers to complete for each removal from the UK. An export declaration does not need to be completed for goods being sent to another EU member state but a dispatch pack must be completed for each overseas address and consignee. The driver collecting the parcels will endorse the receipt copy and return it to the consignor. This, plus the statement of account listing each removal, will provide evidence of removal from the UK. Due to the complexities of the movement of goods within the courier or fast parcel environment, there is often more than one company involved in the handling and ultimate removal of the goods. Ultimately, you as the UK supplier may not be certain as to which courier or fast parcel company has removed the goods. If you’re aware that this may happen you will need to establish what proof of removal you will receive from the company to whom you give your goods. The proof available is described in (a) and (b). If your EU customer arranges for the goods to be removed by courier you should ascertain what proof of removal they will be providing to allow you to zero rate the supply. You should consider taking a deposit equivalent to the amount of VAT you would have to account for if you do not hold satisfactory evidence of the removal of the goods from the UK. The deposit can be refunded when you get evidence that proves the goods were removed within the appropriate time limits. For supplies to unregistered customers, or private individuals, VAT’s normally accounted for by the supplier as a domestic supply in the member state from which the goods are dispatched. As a domestic supply, liable to UK VAT, the normal tax point rules apply. For further information about the normal rules, see the sections dealing with time of supply in the VAT guide (Notice 700). Distance selling occurs when a taxable person in one member state supplies and delivers goods to a customer in another member state who’s not registered or liable to be registered for VAT. These customers are known as non-taxable persons and will include private individuals, public bodies, charities and businesses which are not VAT-registered because their turnover is below the registration threshold or whose activities are entirely exempt. The most common examples of distance sales are goods supplied by mail order or ordered over the internet. Once the value of your distance sales exceeds this threshold, you’ll be liable to register and account for VAT in that member state. If you trade above the UK Intrastat threshold you must report your distance sales to all non-taxable persons on your Intrastat Supplementary Declaration, even when your distance sales from the UK are below the distance selling threshold in the member state of arrival. For further information, see Notice 60: Intrastat general guide. Each member state is responsible for setting its own threshold, which is set in its own currency. The level of the threshold in a particular member state can be found on the website mentioned at paragraph 2.11 or by contacting the VAT authority in the member state concerned. If you make any distance sales of excise goods to another EU member state you’ll be required to register and account for VAT in that member state, irrespective of the value involved. You must keep a separate record of your distance sales to each member state. This will allow you to monitor any liability to register for VAT there. If you’re required to register in another member state, you may need to appoint someone to act on your behalf there. You should check this with the relevant VAT authority (see paragraph 2.11). Alternatively, you may be able to register personally and deal with your tax obligations yourself. If your distance sales are below the threshold you may, nevertheless, opt to register and account for VAT in the member state of destination of the goods. But this does mean you’ll have to account for VAT on all supplies below the distance selling threshold in that member state. You will then be subject to, and must comply with, the VAT rules in that member state. Once you have taken up the option to account for VAT in another member state, you’ll no longer charge UK VAT. You’ll normally be required to remain registered in that member state for at least 2 calendar years from the date of the first supply following registration there. After this time, if the value of your supplies remains below the threshold and you decide to cancel your option, you must notify HMRC by writing to the appropriate written enquiries team. This should not be less than 30 days before the date of the first supply you intend to make after the cancellation. The registration requirements in each member state vary. If you’re required to register for VAT in another member state, you must notify the appropriate VAT authority (see paragraph 2.11). You’re responsible for ensuring that you register at the correct time and that you account for tax to the correct VAT authority. Group treatment is a facility which allows 2 or more corporate bodies controlled by the same person, to account for VAT as a single VAT registration. Although each VAT group member is, and remains, a legal entity in its own right, it’s treated as a single taxable person in the UK. But UK VAT groups are not recognised in other member states. Group members must therefore individually monitor the value of their own distance sales to each member state. Where the value of sales in a calendar year exceeds a member state’s distance selling threshold, that group member will be liable to register for VAT there in its own right. A group member is entitled to exercise the option described at paragraph 6.10. If you make distance sales to the UK, and the value of these sales in a calendar year exceeds the UK threshold of £70,000, you’ll be liable to register for VAT in the UK. You must then charge and account for UK VAT on your sales. But any supplies involving goods subject to Excise Duty are not subject to the threshold and you must register for VAT immediately you make a supply of this kind. You can also register in the UK under the option described in paragraph 6.10. For more information about registering for VAT in the UK for distance sales, see VAT Notice 700/1: should I be registered for VAT. Distance sales from UK below threshold in member state of arrival Box 1 - output tax. In which case the recipient is required to account for VAT on the goods acquired in the UK. You must account for any tax due on your VAT Return for the period in which the tax point occurs (see paragraph 7.3) and you may treat this as input tax on the same VAT Return subject to the normal rules (see paragraph 2.13). Acquisitions are liable at the same rate as domestic supplies of identical goods in the UK. So, for example, no tax is due on acquisitions of goods which are currently zero-rated in the UK. Part or full payment for an intra-EU supply of goods does not create a tax point for the acquisition. You should account for the acquisition tax, provided the date of issue of the invoice is earlier than the 15th day of the month following the one in which the goods were sent to you. The VAT on an acquisition is always due in the member state where the goods are received. But there’s a ‘fallback’ provision that applies where the VAT registration number quoted to the supplier to secure zero rating has been issued in a different member state. In that event the acquisition tax must be accounted for in the member state of registration, but the customer also remains liable to account for acquisition VAT in the member state to which the goods have been sent. You’re liable to account for acquisition tax in the UK unless you can demonstrate that you have already accounted for acquisition VAT in the member state to which the goods were dispatched where this is different (see paragraph 7.7). You can get a refund of any UK acquisition tax accounted for in the circumstances described in paragraph 7.8. But you should only do this where you have not claimed, or have been unable to claim, full input tax credit for that acquisition. If you’re part of a VAT group, you must contact HMRC. It’s in your own interest to do this promptly, as it allows us to make sure that our records are kept up to date at all times. We can then reply correctly and without delay to any enquiries made about your registration number. If you acquire goods from other member states you will need to inform your EU suppliers of any changes to your VAT registration number. Otherwise they’ll have to charge you VAT on their supplies. The amount of tax due on an acquisition is the tax value multiplied by the appropriate VAT rate. This is, usually, what you pay for the goods, it’s also called the ‘consideration’. Consideration is any form of payment in money or in kind, including anything which is itself a supply. The consideration includes any payment which you make to cover your supplier’s costs in making the supply, such as packing, transport or insurance for which they are responsible under their contract with you. Where the value of your acquisition is in a foreign currency, you should convert it to sterling as follows. (a) Unless you have adopted one of the alternatives set out below, you must use the UK market selling rate at the time of the acquisition. The rates published in national newspapers will be acceptable as evidence of the rates at the relevant time. (b) As an alternative you may use the period rate of exchange published by HMRC for customs purposes. The VAT Helpline can give details of particular period rates. You may adopt this alternative in respect of all your acquisitions or in respect of all acquisitions of a particular class or description. If you opt in respect only of a particular class or description you should make a note in your records at the time of adoption of the class or description to which your option relates. You do not need to notify HMRC in advance if you wish to adopt this alternative, but if you make such an option you cannot then change it without first getting HMRC agreement. (c) You may apply in writing to HMRC for the use of a rate or of a method of determining a rate which you use for commercial purposes but which is not covered by (a) or (b) above. In considering whether to allow such applications HMRC will take into account whether the proposed rate or method is determined by reference to the UK currency market, whether it is objectively verifiable, and the frequency with which the applicant proposes to update it. Forward rates or methods deriving from forward rates are not acceptable. Before 1 January 1993 you may have used a rate authorised in writing by HMRC under the concessionary arrangements for supplies which applied up to that date. By concession you may extend this to acquisitions without further notification, unless the rate you use wholly derives from currency markets other than in the UK. Your continued use of these concessionary rates is subject to review by HMRC. Whatever rate or method you adopt, the appropriate rate for any supply is the one current at the time of supply. For goods subject to Excise Duty or, in the case of EU accessionary states, Customs Duty or agricultural levy, the value of the acquisition is the value determined according to the principles outlined in this chapter plus the duty or levy arising from the removal to the UK. A transfer of your own goods from one member state to another within the same legal entity, for example between branches of the same company, is deemed to be a supply of goods for VAT purposes. The transfer of your own goods is liable to VAT in the same way as other intra-EU supplies of goods described in this notice. The supply may be zero-rated subject to the conditions in paragraph 4.3. You’ll normally be liable to account for acquisition VAT in the member state to which the goods are transferred. You may need register for VAT in the member state to which the goods were dispatched in order to meet your obligations to account for acquisition tax and also to account for VAT if you subsequently supply the goods there. You’ll also be able to use that VAT registration number to support zero rating of the deemed supply in the UK (see paragraph 4.3). If you are not registered for VAT in the member state to which you transfer your own goods, you should treat the supply as a domestic supply (see paragraph 6.1). You must account for VAT on the transfer at the appropriate UK rate. This will depend on whether you exceed the UK VAT registration thresholds. For further information about registering for VAT in the UK, see VAT Notice 700/1: should I be registered for VAT?. There are some exceptions which are covered in sections 10 and 11. In each case no acquisition VAT is due in the member state to which the goods are transferred. You do not have a place of business in the member state to which the goods are temporarily transferred. You have a specific contract to fulfil. You intend to return the goods to the member state from which they were dispatched. This can apply to your tools and equipment which you take to another member state to use there, for example to repair or service machinery. It also applies to goods that are loaned or leased to somebody in another member state. For further information about this, see Notice 3001: customs special procedures for the Union Customs Code. The conditions described at paragraphs 10.2 or 10.4 may later cease to be met (for example, in the case of paragraph 10.2, where the goods are disposed of locally rather than returned to the UK or, in the case of paragraph 10.4, they are to remain in the other member state for more than 2 years). In that event the original movement should be treated belatedly as a deemed supply and acquisition, as described in section 9. Although these transfers of your own goods are not treated as supplies for VAT purposes, you still need commercial evidence that the goods left the UK and have later returned. You must also maintain a register of temporary movements of goods, as described in paragraph 16.7. A supply of installed or assembled goods occurs when you supply goods and there’s a contractual obligation for you to install or assemble the goods for your customer. For example a supplier of studio recording equipment where the supply involves installation at the customer’s studio. The supply takes place where the installation or assembly of the goods is carried out. You’re liable to register for VAT in any member state in which you’re supplying installed or assembled goods. But some member states operate a simplified procedure which permits the VAT-registered customer to account for the VAT due. You’re not required to register in a member state which has this facility. Adoption of the simplified procedure is optional for member states. To find out if it’s available in a particular member state you should contact the VAT authority there (see paragraph 2.11). The movement of the goods (for example, the component parts) between member states as part of a supply of installed or assembled goods is not treated as a supply of own goods. Consequently there is no acquisition in the member state of installation or assembly. Under the simplified procedure your UK customer is treated as acquiring the goods in the UK and must account for acquisition VAT on the full value of your supply. As a result you’re no longer liable to account for VAT. Issue your customer with a VAT invoice. Issue that invoice within 15 days of the date on which your supply would otherwise have taken place under normal UK time of supply rules for goods. (For further information about this, see the sections dealing with time of supply in the VAT guide (Notice 700)). These include receipt of a payment, or completion of the installation or assembly. Send a copy of the notification to your UK customer to advise them that you’re using the simplified arrangements and so they’re required to account for the VAT. You must send this no later than the date you issue the first invoice to your customer. You will only have to make further notifications for any new UK customers. As the UK customer you should account for VAT on the supply to you as an acquisition by including the tax in box 2 of your VAT Return. You may also include this as input tax on the same VAT Return subject to the normal rules (see paragraph 2.13). This section outlines the VAT treatment of goods that are moved between member states in circumstances where some form of service is to be applied to those goods. The services can include things like processing, repair and valuation. This can include goods sent to more than one service provider in the other member state or in different member states provided, in all cases, the goods are returned to the UK after the services have been completed. Where it applies there is no deemed supply of own goods as described in section 9. Record the movement of the goods in your temporary movements register (see paragraph 16.7). Hold commercial documentary evidence that the goods have been removed from the UK. Where applicable complete an Intrastat Supplementary Declaration (see paragraph 12.7). For more information about Intrastat, see Notice 60: Intrastat general guide. As the supplier of the service there is no requirement for you to account for VAT on the movement of the goods provided you return them to your customer when the work has been completed. Similarly, provided your customer is registered for VAT elsewhere within the EC, you’re not required to charge VAT on the supply of your services. Your customer will account for this as a reverse charge. For further information about the reverse charge, as it applies to work carried out on goods, see VAT Notice 741A: place of supply of services. Record the arrival and return of the goods in your temporary movements register (see paragraph 16.7). These arrangements do not apply if, for any reason, the goods are not eventually returned to the member state from which they were originally sent. In that event they become subject to the normal intra-EU supply and acquisition rules and the owner of the goods may be liable to register for VAT in the member state concerned. Account for acquisition VAT on the supply of the goods in the normal way. Account for VAT on each of the supplies of services you have received as a reverse charge. For more information about the reverse charge, as it applies to work carried out on goods, see VAT Notice 741A: place of supply of services. This can occur if you make an intra-EU supply of goods and your customer has work performed on them before they leave the UK. In this situation you can continue to treat the supply under the normal rules described in section 3 provided you meet all the relevant conditions. You will therefore need to make sure that your customer provides you with evidence of removal of the goods from the UK once the work has been completed (see paragraph 4.5). 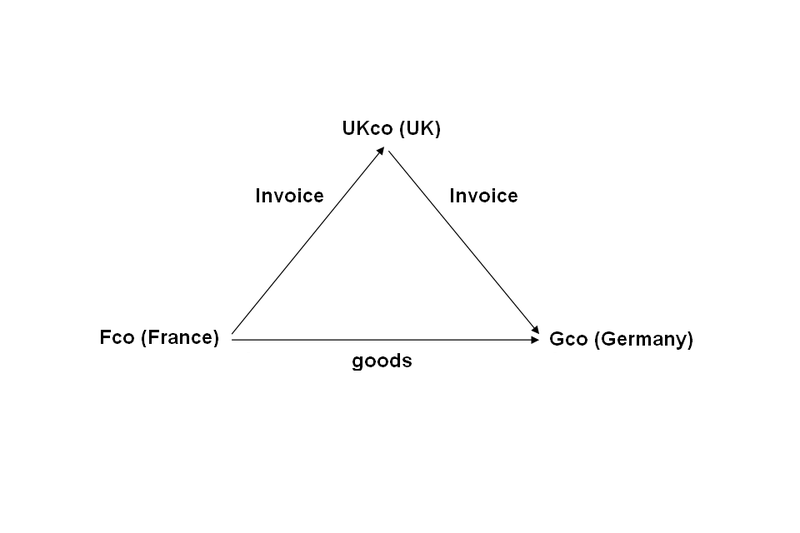 Triangulation is the term used to describe a chain of intra-EU supplies of goods involving 3 parties. But, instead of the goods physically passing from one to the other, they’re delivered directly from the first to the last party in the chain. Here a UK company receives an order from a customer in Germany. To fulfil the order the UK supplier in turn orders goods from their own supplier in France. The goods are delivered from France to Germany. An intermediate supplier is not necessarily required to register in the member state to which the goods are delivered (seeparagraph 13.2) as there’s a simplified procedure which can be used in these circumstances. Use your UK VAT registration number to allow your EU supplier to zero rate the supply of goods in the member state from which the goods were dispatched. Issue a VAT invoice to your customer containing all the details normally required for intra-EU supplies. Include the supply on your EC Sales List (see section 17), quoting the VAT number of your customer in the member state of destination of the goods. Enter the total value of triangular supplies to each EU customer in that quarter on your EC Sales List on a single line separately from any other intra-EU supplies to that customer. Identify your triangular transactions by inserting the figure 2 in the indicator box (the notes on the reverse of the EC Sales List give further details). Omit details of triangular transactions on your UK VAT Return and Intrastat Supplementary Declaration (see section 18). Issue a VAT invoice to your customer containing all the details required by the member state in which you’re VAT-registered. Issue that invoice within 15 days of the date on which your supply would otherwise have taken place under normal UK tax point rules for supplies of goods (for further information about tax points, see the sections sealing with time of supply in the VAT guide (Notice 700)). Send a copy of the notification to your UK customer to advise them that you’re using the simplified arrangements and so they are required to account for the VAT. You must send this no later than the date you issue the first invoice to your customer. You will nott have to make further notifications, but you will have to make further notifications for any other UK customers. On receipt of your copy of your supplier’s notification to HMRC (see paragraph 13.9 - step 4), account for VAT on the goods supplied to you under the simplified procedure as an acquisition (see section 7). Submit supplementary declarations for goods supplied to you under these simplified arrangements (see section 18). Triangulation in these circumstances is not an issue. The supplier may, regardless of the location of the other parties, treat the supply as an export (see VAT Notice 703: exports of goods from the UK). The triangulation simplification arrangements do not apply in these circumstances and it may be necessary for the first supplier or the intermediary supplier to register for VAT in the member state where the supply takes place, depending on who imports the goods. Under international agreements, some people and bodies working in the international arena and hosted by other EU member states may make purchases free of VAT. This section explains when you may zero rate supplies under these agreements. The host government determines what bodies and persons qualify, and it may impose limitations. If your customer has any doubts about their status they should contact their host VAT authority for advice (see paragraph 2.11). Qualifying bodies and persons have a duty to abide by the law and agreements underlying their entitlement to make purchases free of VAT (including limitations imposed by their host member state), and to observe policies controlling abuse of those entitlements. These arrangements apply only to supplies that would otherwise be subject to UK VAT at a positive rate. They do not apply to new means of transport. For further information about the zero rating of new means of transport, see VAT Notice 728: new means of transport. For the purposes of this relief, ‘international organisation’ means an organisation established by a treaty between sovereign governments. An organisation formed by agreement between non-governmental bodies such as limited companies or charities is not an international organisation, nor is a body set up by a single state or government, for example a government department. Well known international organisations include the institutions of the EU, the United Nations and its various subsidiary organisations, and the NATO. You must receive a certificate of entitlement (see paragraph 14.6). ‘Official use’ includes goods the body receives for distribution (including sale) to its members and their accompanying dependants. ‘Personal use’ includes distributing goods to their accompanying dependants for no reward. You, or a forwarder acting on your behalf, must remove the goods to an official address of the embassy, high commission, consulate, international organisation or force in another EU member state or in one of the Sovereign Base Areas in Cyprus. You may consign goods to the post or to a courier or fast parcel service, including the British Forces Post Office (BFPO). If your customer is a British embassy or high commission in another member state, you may consign goods to the Foreign and Commonwealth Office for delivery through diplomatic channels. You must get and keep proof of the removal of the goods from the UK to the customer’s address in the host country. Proof of posting is sufficient. If the supply is for a contingent of British forces in Cyprus or its staff, or for a NATO visiting force in Germany or its staff, the order must be placed by an Official Procurement Agency for the force, such as the NAAFI or a regimental purchasing officer. The supply of services must be made to an international organisation, a NATO visiting force, or a British force in Cyprus, for the official use of the force or organisation. The person placing the order must be based in an office of the force or international organisation in an EU member state other than the UK. Entries on EC Sales Lists are not required for these supplies. Certain supplies of goods under these arrangements must be included on your Supplementary Declarations. For further information see Notice 60: Intrastat general guide. In general, these transactions are not regarded as distance sales and do not count towards distance selling thresholds. Exceptionally supplies to Germany, do count towards your distance selling threshold in that country. If you, as a supplier, receive a certificate claiming VAT relief for any goods or services that fail the requirements of this notice, or if you have any doubts about the documentation you receive, contact the VAT helpline for advice. Call-off stocks are goods transferred by the supplier between member states, to be held for an individual customer in the member state of arrival pending ‘call-off’ for use by the customer as they need them. In the meantime title and ownership of the goods remains with the supplier. Movements of goods to maintain the suppliers own stocks in another member state, or where they are available for call-off by more than one customer, are to be dealt with as consignment stocks (see paragraph 15.3). Goods received in the UK as call-off stocks Box 2 - acquisition VAT for positive-rated goods in UK. Box 4 - input tax subject to normal rules. Consignment stocks are goods you transfer between member states to meet future supplies to be made by you, or on your behalf, in the member state of arrival. The important feature is that the movement of the goods occurs before a customer has been found for them. This can include goods not meeting the conditions necessary for treatment as call-off stocks (see paragraph 15.2). Consignment stocks are treated as a transfer of own goods for VAT accounting and reporting purposes (see section 9). Examples of the circumstances in which they are used are as follows. For further information on the use of AADs and SAADs, see Excise Notice 197: receipt into and removal from an excise warehouse of excise goods. The goods are not for private use. They’re removed or dispatched from the UK to a destination in another member state by or on behalf of the customer. Within 15 days of the end of the month in which they’re moved, you must get (and keep) a receipted copy 3 of the AAD, (see paragraph 15.4). This must be certified by the consignee or VAT authority in the member state of destination. The movement of goods must be completed as soon as possible and the certificate of receipt for the goods must be issued within 4 months of the time of supply. If the conditions in sub-paragraph (a) are not met, the customer is liable for the Excise Duty and VAT. If duty suspended goods go missing in transit then the person who supplied the movement guarantee will be liable for the duty, along with any person who may be jointly and severally liable. Excise goods sold to somebody who’s registered for VAT in another member state are treated in the same way as any other type of goods. Excise goods supplied for private purposes where you arrange delivery to a customer in another member state are covered by the special VAT arrangements for distance selling (see paragraph 6.4). Also the vendor must pay the duty in the member state of destination at the time the goods are delivered. See paragraphs 11.3 and 11.4 of Excise Notice 204b for more information on where excise goods are sold to a customer in another member state. If goods are removed from a tax warehouse in the UK to a destination outside the UK, you will not have to pay the VAT normally due on removal to home use. In such circumstances, either the person making the final supply in warehouse or the person removing the goods can zero rate that transaction provided certain conditions are met. Liability to meet the zero rating conditions must be clearly established before the goods are delivered to avoid any doubt as to where responsibility lies. a country outside the EU Any VAT which would be due on removal to UK home use is not payable - supplies of goods removed from the UK may be zero-rated as exports subject to meeting the conditions in VAT Notice 703: export of goods from the UK. These are goods which are not supplied until they’re adopted by the customer. Adoption occurs when the customer indicates that they’re going to keep the goods. Until then the customer has an unqualified right to return them at any time, unless there’s an agreed time limit after which the goods are to be automatically treated as accepted. Movements of goods that qualify as samples are disregarded for intra-EU supply and acquisition purposes. Details of the conditions that must be met to treat something as a sample can be found in the VAT guide (Notice 700). For further information see section 17 and 18. The reporting requirements for the various types of intra-EU transaction covered by this notice are described in each section. For further information about form VAT 100, see VAT Notice 700/12: how to fill in and submit your VAT Return. The value you enter in box 8, should be the total of all intra-EU supplies of goods made in that reporting period (excluding VAT) and not the value of payments received in that period. The total value of entries on your EC Sales List should agree with the value entered in box 8 of your VAT Return (see VAT Notice 731: cash accounting). You must account for any VAT due on your VAT Return for the period in which the tax becomes due. This is the period when the time of acquisition (tax point) occurs. Paragraph 7.3 provides further information on this. You may also treat this tax as input tax on the same VAT Return, subject to the normal rules for claiming input tax (see paragraph 2.13). The value of services supplied or acquired should not be included in boxes 8 or 9 of your VAT Return. These boxes should only be used to record intra-EU supplies or acquisitions of goods and related costs. You must calculate the VAT due on the acquisition of goods from other member states (see section 7) and enter the total on the ‘VAT payable’ side of your VAT account under the heading ‘VAT due on acquisitions’. You may then deduct the VAT due on these acquisitions as input tax on the ‘VAT deductible’ side of your VAT account, under the heading ‘VAT deductible on acquisitions’, subject to the normal rules for claiming input tax (see paragraph 2.13). Keep a register of temporary movements of goods. The register need not be kept in any particular format (see paragraph 16.8) but it must be readily available for all goods temporarily moved to and from the UK. Include in the register all goods moved between the UK and other member states where they are to be returned within a period of 2 years after their first removal or receipt. It would also be advisable to include any goods for which you’re not sure of the date of return. If you remove goods to another EU member state you must keep the records and detailed accounts described in the VAT guide (Notice 700). Your records must provide a clear link with the evidence required in this notice. It’s important that you follow the accounting instructions explained in paragraph 16.10 if the goods are not removed or you do not hold evidence to show removal of the goods within the time limits. Whether you or your VAT-registered EU customer arranges for the removal of goods to another EU member state, you can only zero rate the supply in your records when the goods are supplied to your customer and you meet the conditions set out in paragraphs 4.3 and 4.4. If the goods have not been removed or you do not have satisfactory evidence of removal within 3 months (6 months for goods involved in processing or incorporation before removal) and the goods would be subject to VAT in the UK, you must account for VAT. You must amend your VAT records and account for VAT on the invoiced amount or consideration you have received. For a VAT rate of 17.5% the VAT element would be calculated at 7/47 and for the 20% rate (from 4 January 2011) at 1/6. To amend your VAT records, you must make an entry equal to the tax on the supplies concerned on the ‘VAT Payable’ side of your VAT account. Include this amount in box 1 of your VAT Return for the period in which the time limit expires. If you do not, you’re likely to be assessed for tax due on the supplies and may incur default interest and a financial penalty. If the goods are subsequently removed from the UK or you later get evidence showing that the goods were removed, you may zero rate the supply and adjust your VAT account for the period in which you get the evidence. This is provided that the goods have not been used in the UK before removal, unless specifically authorised. You should also issue a VAT invoice within 30 days of receiving a payment on account from a customer in another member state. If you wish or need to invoice outside this 30 day period you should contact the VAT helpline explaining the full circumstances. But we may refuse permission. A full VAT invoice must always be issued if you wish to zero rate a supply to a customer registered for VAT in another member state. For further information about information normally required to be included on a VAT invoice, see the sections dealing with VAT invoices in the VAT guide (Notice 700). You can invoice in any currency when you issue VAT invoices for supplies where the customer in the other member state is registered for VAT and their registration number is quoted on the invoice. Where UK VAT is chargeable (for example, on distance sales) the sterling equivalent of the amount of VAT, if any, at each rate must always be shown. For further information about this, see the sections dealing with VAT invoices in the VAT guide (Notice 700). See paragraph 8.5 for information about the exchange rates which may be used. This is an example of a VAT invoice issued for supplies made to a customer in Germany. * This wording is not prescriptive. Similar wording or a reference to the relevant EC or UK law is acceptable. Customer’s VAT registration numbers should be verified using the Europa website VIES VAT number validation or by contacting the VAT helpline. In certain countries for example Spain and Italy, businesses are required to register their VAT number for Intra-EU use and if they do not do this, the number will show as invalid on the VIES VAT number validation checker. You may need to contact your customer and advise them to register the number for intra-EU use. The country code to use as a prefix to your UK VAT registration number is GB. First character is always U. 9 digits prior to 1 April 2005. Prefix any 9 digit numbers with ‘0’. Last character must be a letter. Where 11, 12 or 13 numbers are quoted - delete the first 3 as these are a tax code. May include alpha characters, either first, second or first and second. All alpha characters except I and O are valid. Must be the 11 alpha numeric TVA number, not the 14 digit SERIT number. Must be the 9 character Umsatzsteuer Identifikationsnummer (ust - Id Nr) not the 10 character Umsatzsteuer nummer. Includes one or 2 alpha characters - either last, or second and last. The 10th digit is always B. Includes one or 2 alpha characters - first or last, or first and last. All businesses registered for VAT have to submit EC Sales Lists for their EU supplies of goods or services subject to the reverse charge in their customer’s member state. The information provided on the EC Sales List is used in the UK and by other member states to make sure that VAT has been correctly accounted for. It’s a condition of zero rating for intra-EU supplies of goods that you have a valid VAT registration number for your EU customer. The VIES VAT number validation provides an electronic checking facility for all member states VAT registration numbers (see paragraph 4.9). Other member states have EC Sales Lists, but they’re called ‘recapitulative statements’ or ‘summary statements’. The service is free with registration and enrolment through HMRC online services. For assistance with the online service you should contact the online services helpdesk. You can also submit your EC Sales List on the paper form VAT101. You can get a form VAT101 in various ways. If you run out of space EC Sales List continuation sheet (VAT101A) is available. This will depend on whether you supply goods or services and for goods the quarterly value (excluding VAT) of those supplies. But there’s no requirement to submit nil EC Sales Lists. You can find out how to change your VAT Return periods at VAT registration: Changes to your details. The form VAT101 is specified in this section of this notice for the purposes of VAT Regulations (SI 1995/2518), Regulation 22A(2)(a). If you make a supply of services to a business which is not registered for VAT in their member state because it is below the registration threshold, but which has provided you with evidence that it is in business (for place of supply purposes), you should not include these supplies on your EC Sales List. If you fail to submit your EC Sales List by the due date (see paragraph 17.8) you may be liable to a penalty of £5, £10 or £15 for each day that you’re late, subject to a maximum of 100 days. The rate applied will depend on the number of times you have been late. You’ll remain liable to penalties without notice until 12 months have elapsed without further default. You will not be liable to a penalty if you can satisfy us that you have a reasonable excuse (see paragraph 17.13). There’s no legal definition of reasonable excuse but we’ll look closely at the circumstances of each case. If you can show that your conduct was that of a conscientious business person who accepted the need to comply with VAT requirements, then there may be a reasonable excuse. Genuine mistakes, honesty and acting in good faith are not accepted as reasonable excuses for penalty purposes. The law provides specifically that you do not have a reasonable excuse if you relied on some other person to perform any task for you. will not be accepted as a reasonable excuse for the material inaccuracy. In such cases you may also be liable to account for the VAT on any supplies where you have not met the requirements for zero rating (see paragraph 4.3). If you submit a paper EC Sales List we will notify you of any errors that we identify on a form VAT104 (EC Sales List Error Report). The computer-generated form is sent to you with a copy of our ‘Helpful hints’ document. The form will show the error lines and the reasons for the errors. Correct the errors in the spaces provided and return the form within 21 days of receipt to the address shown. Alternatively, you can voluntarily submit a VAT101B to notify HMRC of any errors made. If you submit your EC Sales List online using the ECSL service, any errors are highlighted on screen as you complete the form, allowing you to correct them prior to submission. If you choose to submit the EC Sales List with some errors still remaining, you will be able to correct these errors online, up to 21 days after the date of submission. After that date, the facility will no longer be available and any outstanding errors will be notified to you in writing. If you submit by CSV or XML you can still use the online correction service to correct error lines identified at the time of submission. Alternatively, if you decide to submit a new file, you must delete the error lines from your original submission within 21 days, using the ‘Correct declaration errors’ page on the ECSL Online Service, to avoid receiving correspondence on this subject. Use EC Sales List correction sheet to tell us about any errors you’ve made. For help with correcting errors contact the VAT Helpline or email the ESL Helpdesk: esl.helpdesk@hmrc.gsi.gov.uk. You should contact HMRC to arrange to do this. You will be given a 3-digit code for each branch or company in your business. You will need to use this as an identifier when you complete the separate EC Sales Lists. If you wish to submit data online for individual branches you must register each one separately with HMRC online services. Note that if the total value of goods supplied from all the branches of your business is more than £70,000 (excluding VAT) in the current or previous 4 quarters, each branch will have to submit a monthly EC Sales List. You may use an agent to act on your behalf, but the legal responsibility for the accurate and timely completion and submission of an EC Sales List remains with you. Any agent can submit an online EC Sales List on behalf of a client but the agent must be registered for VAT and appointed online by the client to act on their behalf. The client should enrol online, as an organisation, for the EC sales service. An activation PIN will be issued (by post) and once the client has activated the service, they should login to the Government Gateway website and select ‘Manage services’, then ‘Appoint agent’, They should then enter the agents reference number, in order to link their VAT number to the agents online account. If your only EU supplies are part of a triangular transaction, you’re still required to submit an EC Sales List and this can be submitted online, or by phoning the VAT helpline who will arrange for EC Sales Lists to be sent to you automatically. If your only EU supplies are services subject to the reverse charge in your customer’s member state, you’re still required to submit an EC Sales List (see paragraph 17.21). You must complete an EC Sales List if you make supplies of goods to a trader registered for VAT in another member state, including the transfer of your own goods and goods that would be zero-rated if supplied within the UK. You’re making a deemed supply of goods and you must include it on your EC Sales List. The value you show is the cost to you of the goods. Samples or gifts may be excluded provided you meet the conditions described in the section dealing with output tax in the VAT guide (Notice 700). If you make supplies of goods to customers who are not VAT-registered in other member states and you’re responsible for delivery of the goods (distance selling - see section 6) do not enter these supplies on your EC Sales List. You do not include temporary movements unless the conditions relating to the transfer change (see section 10). Deduct the value of the credit note from the value of the supplies made to your customer. If the value of credit notes exceeds the value of supplies show the resulting negative figure using a minus sign. The law requires that businesses report supplies of services that are taxable in the customer’s member state (from 1 January 2010) and the onus is on businesses to comply with the law. If reasonable attempts, which may include discussing with the customer, or the customer’s tax authority, have failed to ascertain what the VAT treatment is in the other member states, businesses may wish to assume that the UK VAT treatment will apply to those supplies. This is on the basis that it should be consistent with the EC Principal VAT Directive and therefore with the law in other member states. If subsequently it becomes clear that a supply categorised and reported as taxable is in fact exempt, or vice versa, the business must submit a VAT101B EC Sales List correction sheet. Once the business has knowledge that a VAT treatment of a supply in a member state is different to that in the UK, it should adopt this treatment in their reporting of such supplies to that jurisdiction in the future. You should only record on an EC Sales List supplies to businesses in other member states that are VAT-registered and can provide a valid VAT registration number. If you make a supply to a business which is not registered for VAT in their member state because it is below the registration threshold, but which has provided you with evidence that it is in business (for place of supply purposes), you should not include these supplies on your EC Sales List. This is because the absence of a VAT registration number would cause it to be rejected. But in some cases receipt of the supply will result in the business being required to register in their member state. If this is the case and a VAT registration number is subsequently given to you, an amendment should be made to the EC Sales List using form VAT101B EC Sales List correction sheet. The date on which a transaction should be included on the EC Sales List is dependent on the time of supply rules in the customer’s member state. On the basis that other member states rules are, like the UK’s, consistent with the adopted EU legislation, the time of supply will be either the date of payment or performance (completion), whichever is the earlier. There is no requirement for a business to confirm with the customer that the EC Sales List period and the VAT period on which they declare the transaction as a reverse charge match. For the purposes of completing an EC Sales List, where it is evident that for certain types of supply the date of performance or date of payment is almost the same as ‘date of invoice’, the ‘invoice date’ may be used. As a general principle we will accept reliance on an invoice date or any other reasonable methodology provided it does not produce a manifestly inaccurate overall result. Ultimately it is up to individual businesses to identify the most appropriate methodology for their particular circumstances. You can use the quarterly invoice date to complete your EC Sales List for continuous supplies of management services. EC Sales Lists are only required for taxable supplies where the recipient is liable to account for VAT under the reverse charge provisions. For zero-rated supplies there is no reverse charge so there’s no EC Sales List requirement. Intrastat is the name given to the system for collecting statistics on the trade in goods between member states. Intrastat replaced customs declarations as a source of trade statistics within the EU. It exists throughout the EU and requirements are similar in all member states. Supplies of services are excluded from Intrastat except where they’re related charges such as freight and insurance and form part of the contract to supply goods. All businesses carrying out trade with other member states must declare the totals of their sales and acquisitions on their VAT Returns. Those businesses over a legally set threshold are also required to provide more detailed information on Intrastat Supplementary Declarations. Intra-EU trade statistics are compiled from the Supplementary Declarations and estimations made using the information on the VAT Returns. For details of the current Intrastat threshold see Notice 60: Intrastat general guide. All businesses registered for VAT must complete 2 boxes on their VAT Returns showing the total value of goods supplied to other member states and the total value of goods acquired from other member states, see paragraph 16.3. For further information about this, see VAT Notice 700/12: how to fill in and submit your VAT Return. Those businesses with a value of trade in goods with other member states above the Intrastat threshold for either acquisitions or supplies of goods must complete Supplementary Declarations each month. For further information about this, see Notice 60: Intrastat general guide. For Intrastat purposes, goods received into the UK are called arrivals and goods consigned to another member state from the UK are called dispatches. This is because the Intrastat system developed separately from the VAT system and there are some differences in coverage between the 2 systems. For further information about this, see Notice 60: Intrastat general guide. For further information about Intrastat requirements, see Notice 60: Intrastat general guide. If you cannot find the answer to your questions there, the VAT helpline will help you. You should make it clear that your enquiry is about Intrastat. You can also get detailed guidance and updates on Intrastat matters on the Intrastat pages on the UKtradeinfo website. If you want to make Intrastat declarations online, contact the Intrastat helpline. Guidance on submitting your forms electronically can also be found on the Intrastat pages on the UKtradeinfo website. 24 October 2018 Paragraph 15.4(d) has been corrected to align with excise guidance. A vendor is responsible for UK Excise Duty when excise goods move between EU member states, as well as appointing a UK representative to account for their duty. 31 July 2018 Section 17.9 updated to provide more guidance on changing your VAT Return periods. 3 January 2014 First published.